(Nanowerk Spotlight) Anthrax is an acute infectious disease caused by the bacteria Bacillus anthracis and is highly lethal in some forms. Anthrax spores can and have been used in biological warfare. "Weaponizing" the spores requires a process to make an aerosol form of anthrax so that they easily can enter the lungs. Inhalation is the most lethal form of anthrax infection. Consequently there has been significant interest in the surface structure and characteristics of anthrax spores as related to their binding by molecular species. The investigation of such binding is obviously important to the development of countermeasure technologies for the detection and decontamination of anthrax spores. A group of researchers at Clemson University have come up with an agent that clings to the anthrax spores to make their inhalation into the lungs difficult. "We show that the carbohydrates on the spore surface can be targeted for binding by carbohydrate- modified nanotubes, and the binding is sufficient to cause substantial aggregation of the spores" Dr. Ya-Ping Sun explains his group's recent findings to Nanowerk. Sun is a professor of materials/organic chemistry at Clemson University in South Carolina. 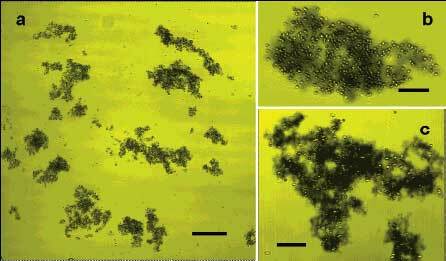 The recent findings, titled "Unique Aggregation of Anthrax (Bacillus anthracis) Spores by Sugar-Coated Single-Walled Carbon Nanotubes", were published in the September 23, 2006 online edition of Journal of the American Chemical Society. Sun said a similar approach using sugar-coated carbon nanotubes to stop the spread of E. coli bacteria was tested successfully in 2004 ("Single-walled carbon nanotubes displaying multivalent ligands for capturing pathogens"). There, a single-walled carbon nanotube was exploited for its semi-flexible pseudo-one-dimensional nanostructure as a unique scaffold to display multivalent carbohydrate ligands, with a specific demonstration showing that galactosylated carbon nanotubes were effective in the capturing of pathogenic Escherichia coli in solution. Anthrax spores are covered with carbohydrates, or simple sugars, that are used to communicate with or attract other biological species. The Clemson team used single-walled carbon nanotubes as a platform or scaffolding for displaying sugar molecules (monosaccharides – derivatized mannose or galactose) that would attract the anthrax spores. When sugar coated, the carbon nanotubes bind with the anthrax spores to create larger clusters. This substantial aggregation of the spores may hinder the inhalation infection. Therefore, the finding may lead to the development of countermeasure technologies. "We would like to look at technology development aspects of our finding, including potential applications in decontamination and also in rapid identification assays for screening suspicious white powdery materials" says Sun. He sees this new method potentially as a way for first responders to contain anthrax in an office or mailroom setting using a water-based gel, foam or aerosol spray, and he thinks it has potential application on the battlefield in larger quantities.